Today was the best day of Yellowfin Tuna fishing so far this season! For those keeping score, we have gone from seeing scattered ones and twos in the counts, to the occasional handful or two. Today we saw counts of 20, 30, 40 and even 50+ Yellowfin Tuna on the 1 day, 1.5 and 2 day boats. Fish were caught in all the classic styles, such as troll strikes on porpoise, Tern birds marking spots of fish, small sonar schools, breezers and kelps. They were hooked on live bait, flat fall jigs, poppers, and jigs. 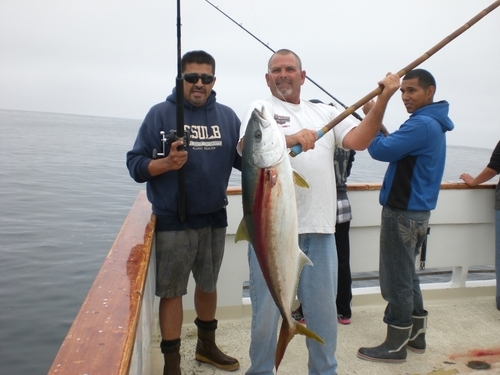 Limit style fishing on good grade Yellowtail and some dorado on kelps were also mixed in and cow Bluefin Tuna continue to be present in the same zone! The Grande has a DEFINITE GO trip to fish this area departing Friday night, July 8th and has a very light load. This is a 1.5 day trip allowing you to spend the entire day on the grounds. This is a trip you don't want to miss! Get in on the action before the crowds show up! Please call (619) 223-1627 for booking or click on the "book online" tab. We hope to see you this weekend on the Grande with Captains James McDaniels and Shawn Trowbridge.